This is our most comfortable seat style yet and it is a 15" wide and 14" long" Desertï Tan Leather With Light Tan Stiching Spring Solo Tractor Seat. This leather color is a very good match to the Indian desert tan leather. It is a great color that will look great on a lot of bikes. 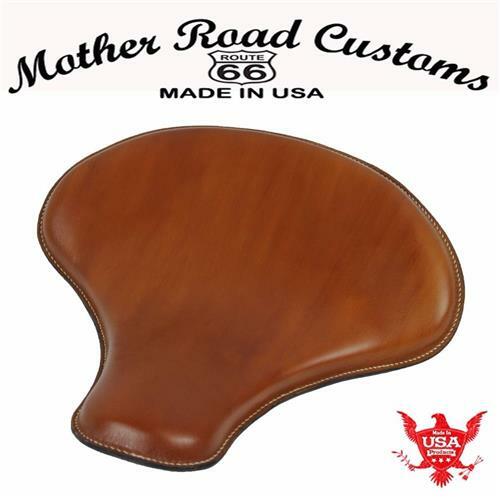 This seat will add a really cool old vintage look to your bike. We start with 1/8" steel pan built in our shop. The pan is very thick, rigid, and sturdy. The pan has a kick up in the back to hold you on the seat. The seat is ergonomically correct to provide a comfortable ride. The seat measures 15" wide by 14" long. The studs in the rear are 7" apart. Next we lay up 1" and shape high density urethane closed cell foam on to the pan, to give good support and comfort. Then the foam is covered with 3 layers of 100% heavy duty distressed veg tanned leather. Lastly, it is sewn together with heavy duty nylon thread, similar to the way a shoe sole is sewn onto the upper. The qualities of this leather are long life, and durability. The shape and profile of the seat is designed to sit low, to give a slim profile. Please Note: The mounting hardware is not included with this listing. You can call me at 314-972-4305 to ask questions, or to make a purchase over the phone.